Particle technology is a term used to refer to the science and technology related to the handling and processing of particles and powders. The production of particulate materials, with controlled properties tailored to subsequent processing and applications, is of major interest to a wide range of industries, including chemical and process, food, pharmaceuticals, minerals and metals companies and the handling of particles in gas and liquid solutions is a key technological step in chemical engineering. 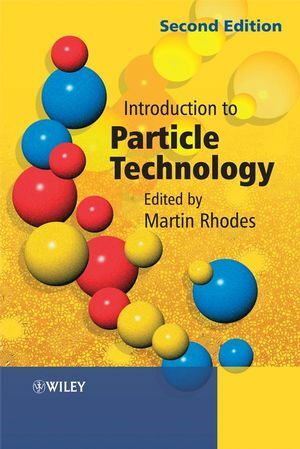 This book is essential reading for undergraduate students of chemical engineering on particle technology courses. It is also valuable supplementary reading for students in other branches of engineering, applied chemistry, physics, pharmaceutics, mineral processing and metallurgy. Practitioners in industries in which powders are handled and processed may find it a useful starting point for gaining an understanding of the behavior of particles and powders. "..This is a modern textbook that presents clear-cut knowledge. It can be successfully used both for teaching particle technology at universities and for individual study of engineering problems in powder processing." Martin Rhodes holds a Bachelor's degree in chemical engineering and a PhD in particle technology from Bradford University in the UK, industrial experience in chemical and combustion engineering and many years experience as an academic at Bradford and Monash Universities. He has research interests in various aspects of gas fluidization and particle technology, areas in which he has many refereed publications in journals and international conference proceedings. Martin is on the editorial board of Advanced Powder technology. Martin has a keen interest in particle technology education and has published books and CDROM on Laboratory demonstrations and directed continuing education courses for industry in the UK and Australia. He was co-founder of the Australasian Particle Technology Society. Martin has a Personal chair in the Department of Chemical Engineering at Monash University, Australia, where he is presently Head of Department. 2. Single Particles in a Fluid. 5. Colloids and Fine Particles. 6. Fluid Flow Through a Packed Bed of Particles. 8. Pneumatic Transport and Standpipes. 9. Separation of Particles from a Gas: Gas Cyclones. 10. Storage and Flow of Powders-Hopper Design. 14. Health Effects of Fine Powders. 15. Fire and Explosion Hazards of Fine Powders.